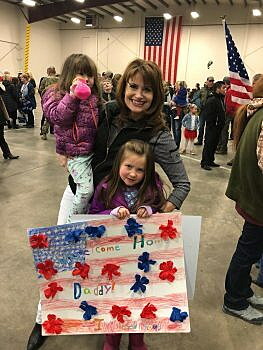 (The Electric) About 65 Montana Army National Guard soldiers with the 495th Combat Sustainment Support Battalion returned home this weekend after a nine-month deployment to Afghanistan. That includes the director of the C.M. Russell Museum, just in time for Western Art Week, and a science teacher from C.M. Russell High School. Maj. Tom Figarelle was the operations officer for the battalion during the deployment. He’s also the director for Russell Museum. 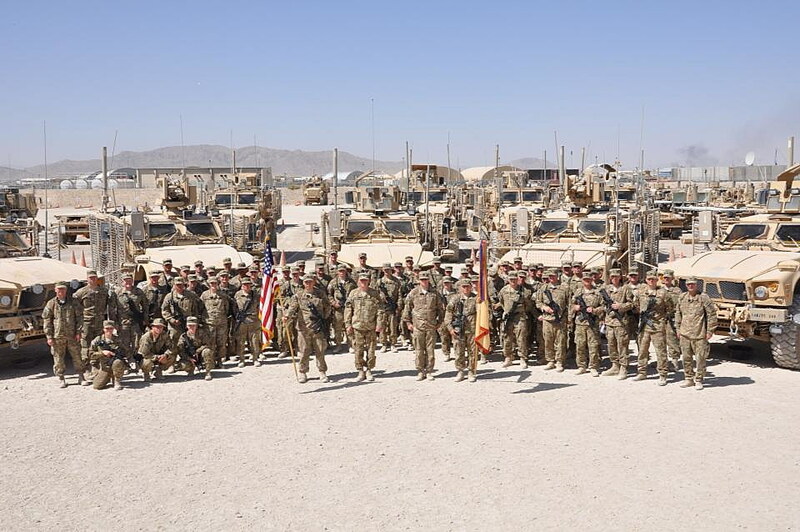 While deployed, Figarelle did general mission planning for the battalion and was responsible for oversight of the sustainment enterprise on Bagram Air Base in Afghanistan. The base is a major supply point for operations in Afghanistan and includes a series of supply warehouses, the central issue facility, and handled fuel and ammunition supply for operations throughout the country. The base handled $230 million worth of assets, Figarelle said, and most of their work was with contractors. So Montana soldiers served as contract oversight and assigned all of the accountability for fuel, supplies and other logistics, Figarelle said. Lt. Col. Mike Beck was the battalion commander and has taught with Great Falls Public Schools for about 20 years. In a nutshell, he said, the battalion had responsibility for logistical support for more than of Afghanistan, to include fuel, field rations, supplies and more. Most of that was done through contractor support. Bagram is the largest U.S. base in Afghanistan and they had responsibility for the largest ammunition supply point in the entire country, the largest warehouse within U.S. Central Command, and Beck said he had soldiers in up to 11 other locations throughout Afghanistan handling fuel, water, food and other logistical support to military posts. The Montana soldiers were from the 495th headquarters company out of Kalispell. The group had about 70 soldiers and joined with the hundreds of other soldiers that form the entire battalion and roughly 5,000 contractors that fall under their responsibility, Beck said. Figarelle, a Great Falls native, was promoted to major while deployed and has been with the battalion for about 4.5 years and nearly 16 years with the Montana Army National Guard. Montana Gov. Steve Bullock shared this photo on Twitter of a family greeting the Guard to Kalispell on Saturday night. This was his first deployment and Figarelle said he’s fortunate to work with a professional staff and supportive board at the museum who were willing to take on additional roles while he was deployed. He said he was hired as executive director with the board and staff knowing he’d been deployed at some point, which he said reflects the board’s confidence in the entire staff. The board chair, who lives in Denver, flew in monthly to support Western Art Week preparations while Figarelle was gone. Beck has worked for GFPS for 20 years and said the district has always been supportive of his military service, whether it be a deployment, training or state missions. There was one period when he was out of school for about four years due to military service and the district has worked with him, he said. He’s planning to go back to school after a bit of a break once he gets home, but said he’ll have to work with GFPS to see what his role will look like since it’s mid-year for schools. Beck and Figarelle said they’re both looking forward to getting home to their families. For Beck, he’s looking forward to travel with his family this summer, lounging around the house, and seeing his dog. “It’s just those kinds of things you miss,” he said. The 495th was in Afghanistan for nine months and trained at Fort Hood in Texas for about a month prior to their departure. They arrived back at Fort Hood on March 8 and returned to Kalispell late Saturday.